We moved into our house 6 years ago this summer, and bought several shiny new appliances to match the shiny new house we’d just built. (Yes, we. My hands and lumbar region have never quite recovered from lugging breeze blocks about, and picking the builders’ cigarette packets off the floor, despite my pointedly supplying a well-placed bin. I was eventually obliged to withdraw their cake perks as a result.) These shiny new appliances are now turning up their collective toes in unison. Our washing machine (which is actually nearly 8 years old, as I demanded that John’s house acquire one before I moved into it. Previously, he took his washing home to his mother once a week. He was 30.) has acquired a deeply unpleasant old-water smell that taints every load of washing placed inside it. I have scoured comment threads for smelly machines, cleaned everything that can be cleaned, and it has not improved matters one jot. 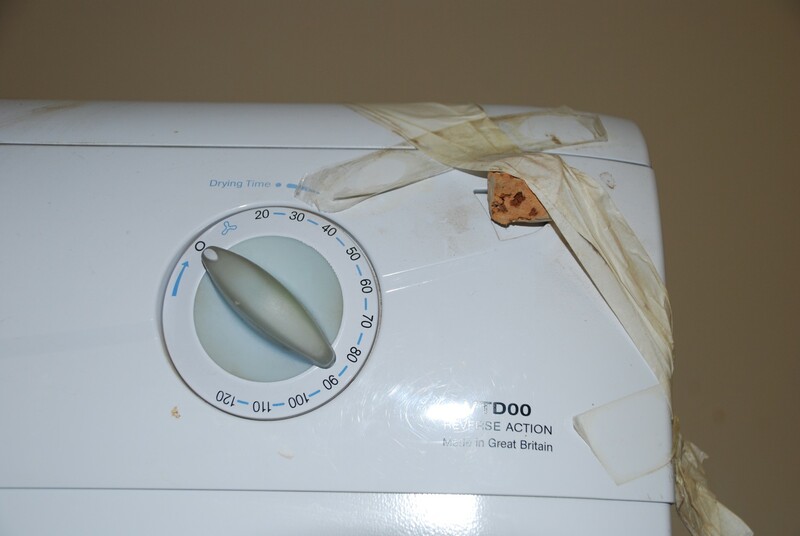 Only blasting with the tumble dryer set to Max banishes the smell from our clothes (see masking tape and wine-cork improvisation above). John broke the tablet-dispenser whatchamacallit door on our dishwasher within weeks of purchase and never got around to re-fitting the spring, so we have been carelessly chucking the tablet inside loose for years. Recently, the top tray is becoming increasingly divorced from the vital bits of metal that prevent it parting company with the dishwasher mothership, and has taken to crashing – expensively so – down onto the bottom layer of crocks. In addition, during the last fortnight its cleaning of cutlery has become noticeably substandard. Significant smearage has been reported. The freezer section of our fridge-freezer packed up last Saturday. Astoundingly, considering he had just rolled in from a rural tractor-pull very well lubricated indeed, Hairy ‘Beady’ Hubby noticed that the tiny high-temp-warning LED had lit up, and we were able to transfer the still-solid food to our chest freezer. I rang Hotpoint, who were suspiciously desperate to sell me an extended aftercare package for about half what the machine is worth – per annum; I also rang a local chap who told me kindly that 6 years from a frost-free Hotpoint was all I could realistically expect, and it sounded like the compressor was going. He would buy a new one, apparently. My parents have a perfectly serviceable and energy-efficient fridge living in their shed for Dad’s fishing bait – that they had in their old house. They moved when I was 2, and I won’t see 34 again. The silver lining to the fridge-freezer Sadness should have been that, as John and I have hankered painfully after one of those huge American-style muthas with an ice maker and sufficient cubic capacity in which to lose an entire tribe of hairy farmers, we could, if we robbed a bank, upgrade. Except we can’t, coz some monumental fuckwit managed to design a monstrous 5 x 6 metre kitchen in such a way that only a 600mm appliance will fit. I hate that things don’t last, and are cheaper to replace than fix. It’s so wasteful! And what is it with household appliances? They always die in clusters even if you bought them at different times. Also, remind me not to use your kitchen designer. Lovely, though she is. Yes, I have had opportunity to note that modern appliances are designed to self-destruct after 7 years. They don’t put the stuff in them nowadays, as my father would say. Also, that is some very cool artwork, on the soon-to-be-dead fridge freezer. 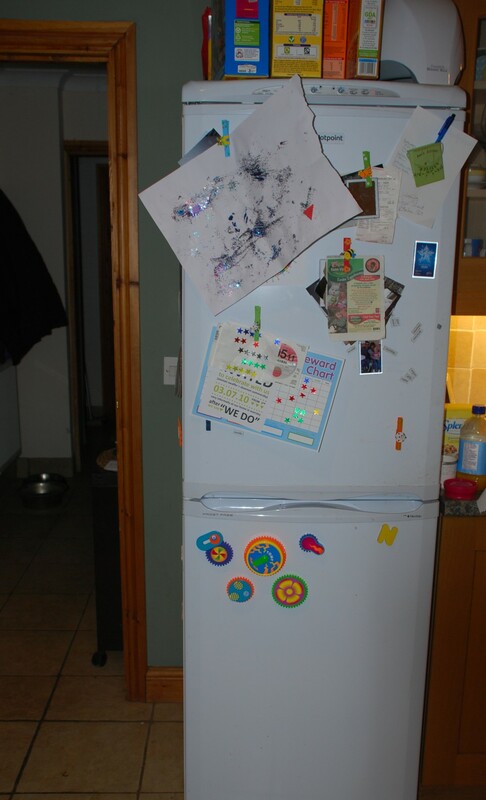 Well, our fridge totally died a couple of years ago, both compartments. It would turn on, but nothing would happen. We replaced a part to the compressor for about $195 US dollars. What’s that there, like $300 quid? Anyway, you might have someone come look at it for certain before you drop the money for a new one. And, personally, I would just reach behind the fridge to turn on the light and get a bigger one. That’s just me. I managed to make my old washing machine last 12 years but the newish one is a piece of crap. It seems that the only ones that continue to work these days are the astronomically expensive Germanic ones. And I totally love the cork idea. I plan to use it on the YCU. Soon. Our dishwasher’s soap dispensing drawer broke just after the warranty expired. We just chuck the soap in there randomly. Fortunately, our racks are still intact. Our washer and dryer are 9 years old now, and still working mostly just fine (knocking on wood, here). We dry things all the time, as it is considered…declasse (add your own accent marks – I don’t know how)…to hang your wash outside. Many subdivisions actually forbid that (along with yard art). I cannot imagine what on earth you keep in that tiny little refrigerator. Beer? It might store my condiments, I suppose, plus a gallon of milk. Maybe a pint or two of ice cream. We’re now pondering whether to go ahead and replace the fridge, which is so old that the label on the door states that the other available colors are avacado green and harvest gold. Oh my! I know of two bathroom suites in each of those colours, which must be of the exact time you refer to, but…a GREEN fridge?! Awesome! Oooh, shame on the fridge, my friend. We just upgraded ours and in the interval since we last paid for one (read the neolithic period) they’ve all gotten huge here. The new one JUUUUST fits into the recess we have. My icemaker in my fridge is broken–this after a 700 dollar compressor replacement last month (because who can sell a house with a broken fridge?). My toaster is broken. My DVD player is broken. My car is about to fail mandatory state inspection. My mother is here, and wants to make soup in a blender, but my ex husband took the marital blender, so I have none. I have no queen sized sheets, having ruined every pair through menstrual incompetence. My mother is sleeping on a king-sized duvet cover tucked round the mattress to mimic a sheet. My own bed is covered in a hideously bloodstained sheet that I have to hide from the children whenever they come get in bed with me to read before lights out, or in the morning, by flinging my body across the worst of the stains. You have simply no idea how cheered up I was reading this! In a NICE way, of course. I am not the only Sufferer, which is comforting. I am in the US and our ten year old fridge (24 cu ft, of course, only part of the hairy farmer family would fit) is on the fritz. The ice machine has been repaired three times now. The shelves are falling off of the walls and the door shelves detach (permanently) if I sneak too much weight onto them. I’ve been told that I am expecting too much. A $2200 fridge shouldn’t be expected to last more than 8-10 years. SImilarly, our ten-year-old microwave and dishwasher are pleading for mercy. That is, apparently, the same life expectancy as our $6000 heat pumps (two of them) that control temperature in our house. Seriously, I wouldn’t mind spending a mint if the damn things would stick around for awhile. We’ve completely given up on car DVD players. The kids will have to enjoy the scenery on this year’s vacations.